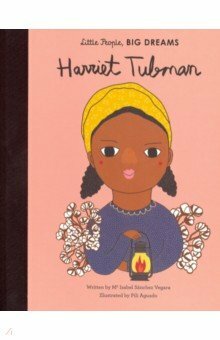 New in the critically acclaimed Little People, BIG DREAMS series, discover the incredible life of Harriet Tubman, the Underground Railroad conductor who never lost a single passenger. Little Harriet was born into slavery on a plantation in Maryland. Though life was hard, Harriet persisted. She used all of her strength and bravery to escape slavery and journey north on the Underground Railroad. Harriet made the dangerous mission back to the South many times, fighting her whole life to bring others with her to freedom. This moving book features stylish and quirky illustrations and extra facts at the back, including a biographical timeline with historical photos and a detailed profile of the abolitionists life. Little People, BIG DREAMS is a bestselling series of books and educational games that explore the lives of outstanding people, from designers and artists to scientists and activists. All of them achieved incredible things, yet each began life as a child with a dream. This empowering series offers inspiring messages to children of all ages, in a range of formats. The board books are told in simple sentences, perfect for reading aloud to babies and toddlers. The hardback versions present expanded stories for beginning readers. Boxed gift sets allow you to collect a selection of the books by theme. Paper dolls, learning cards, matching games and other fun learning tools provide even more ways to make the lives of these role models accessible to children. Inspire the next generation of outstanding people who will change the world with Little People, BIG DREAMS!